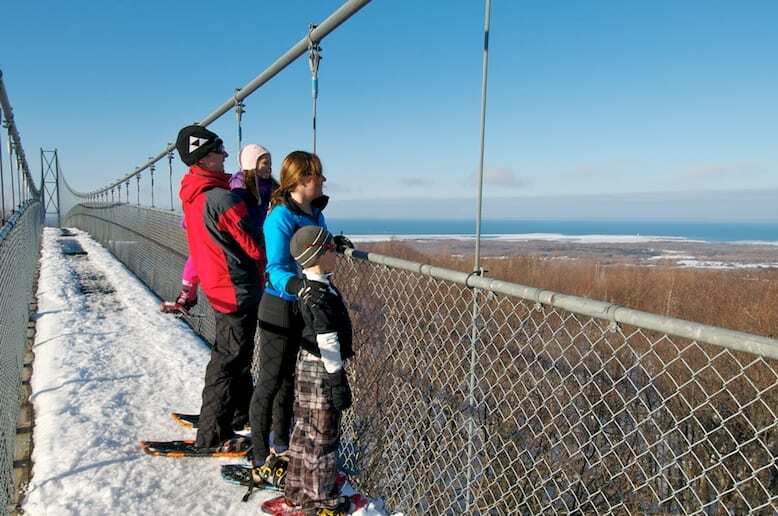 Activities in the winter at the Scenic Caves Nordic Centre include groomed cross-country skiing, snowshoeing and traversing 420 feet over Southern Ontario’s longest suspension bridge. This spectacular winter playground at the highest point of the Niagara Escarpment is set in one of Canada’s sixteen UNESCO biosphere reserves. The suspension bridge features panoramic view of Georgian Bay and the varied, picturesque nature trails range from gentle rolling slopes to steep climbs. Inspired by nature, the trails at Scenic Caves Nordic Centre wind through a 200 year old forest rich with wildlife. Winter owls and a wide variety of other birds will beckon to you from the 100 foot tall maple, beech and oak trees, while deer and many other animals can be seen in the forest. Each year, trails are improved and expanded to provide the finest winter recreational experiences. Scenic Caves Nordic Centre boasts 27 kilometers of professionally groomed beginner and intermediate cross country ski trails for both skate and classic styles. Ideal for recreational skiers. Get out and enjoy the 10 kms of snowshoe trails, one of which crosses the suspension bridge for a breathtaking view of the countryside. During the winter season, our staff updates the trail conditions and weather reports early each morning to offer you ‘up to the minute’ information. The Scenic Caves Nordic Centre is generally open from early December to the end of March (sometimes into April), depending on weather and trail conditions. Open seven days a week from 9am – 5pm. The Canadian Ski Council offers links to your favourite ski areas, beginner packages, Grade 5 student free skiing and snowboarding opportunities, nationwide event listings, as well as lots of tips and stories. Also SnowOnline Enews – information and deals on skiing, travel, equipment and racing throughout Canada. The Ontario Snow Resorts Association provides a guide to Ontario’s best ski resorts. Toronto’s largest traveling ski club has been encouraging folks to get out of the city and onto the slopes and trails since 1950. Dedicated to promote year-round outdoor activities such as cross-country skiing, hiking, cycling, canoeing and kayaking, it provides its members with participation and training opportunities.